The 1960s documentary The Endless Summer chronicled the quest of two California surfers who circled the globe in search of the perfect wave. To my knowledge, no filmmaker has ever done anything comparable for skiers and snowboarders who spend the southern hemisphere winter - June, July, August - in search of perfect runs when northern hemisphere snowmelt turns the Alps, Rockies, Sierras and other great mountain ranges into destinations for hiking, whitewater rafting and kayaking, and other summer pursuits. In reality, the southern hemisphere landmasses are much smaller than those in the northern hemisphere, and there are far fewer options for skiers than for surfers. 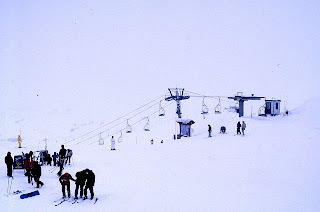 Australia, New Zealand, and even South Africa offer some skiing possibilities, but only the Andes of Chile and Argentina offer the diverse terrain and heavy high-altitude snowpack that brings professional and Olympic level skiers for extended training, and recreational skiers for relatively quick getaways from North America and Europe. In Chile’s case, some of the best resorts, such as Valle Nevado (pictured here) and La Parva, are just an hour or less from downtown Santiago, so there’s no changing planes or extensive overland trips to get to the slopes (though there are also more distant areas such as Portillo and Termas de Chillán). Last weeks’ storms brought about seven feet (more than two meters) of new snow, which makes it likely the season will extend well into September. Dating from 1876, the English-language Buenos Aires Herald has an illustrious history - never more so than in the Dirty War days of 1976-83, when it outspokenly exposed the brutality of the military dictatorship that ran Argentina during those years. While it had the advantage of publishing in a foreign language that relatively few Argentines read, it also published its editorials in Spanish, and both editor Robert Cox and his associate Andrew Graham-Yooll had to flee into exile because of death threats to themselves and their families. Cox’s successor James Neilson, still a columnist today, moved his family across the river to Uruguay. In less contentious times, the Herald has lost some of that edge, but it still provides a good critical analysis of Argentine politics, labor, and society for non-Spanish speakers. Graham-Yooll, who still contributes to the paper on occasion, is also a literary journalist and novelist capable of interviewing Gabriel García Márquez in Spanish and translating his work flawlessly into English. The current staff is not so thoroughly bilingual, and attentive readers will notice linguistic eccentricities, such as occasional false cognates and Spanish-language syllabification. More importantly for overseas residents and potential visitors, the Herald’s acquisition by the financial daily Ámbito Financiero has meant an infusion of cash that’s allowed it to improve its website dramatically, with most of the content now available online after 2 p.m. Argentine time daily. The Sunday edition has an excellent summary of the week’s events by columnist Martín Gambarotta, and there is also improved coverage of food, wine, nightlife, and travel. Where's the Bife? Argentines Becoming Vegetarians? Citizens of the Southern Cone, especially Argentines, are renowned as carnivores. According to a recent article in The Economist, though, the Argentine diet is changing so that vegetarianism is no longer an eccentricity. Consistent with its market-oriented economic determinism, The Economist attributes this primarily to beef shortages and rising prices, noting that per person consumption will fall from 68 kilos in 2008 to 57 kilos in 2009. At the same time, it acknowledges some Argentines’ concerns about the impact of high beef consumption on personal health. In reality, despite Argentina’s reputation for elevated beef consumption, it’s probably the easiest Southern Cone country in which to be a vegetarian. While beef has long been a staple, vegetarian buffet restaurants have been abundant in Buenos Aires since the 1980s, even if their quality was only so-so for the most part. 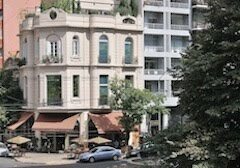 There were exceptions, such as Palermo Soho’s established La Esquina de las Flores, and there are even more today, such Palermo Hollywood’s organic Bío Restaurant, both of them cited in The Economist article. Even at non-vegetarian restaurants, though, vegetarian items such as pastas and savory pies - chard pie is a standard in many Argentine households - are genuine options. Still, diners need to be alert to the sauces - especially since Argentines often use the term carne (meat) to refer to beef. Chicken, pork, and the like are something else - often referred to as carnes blancas (white meats). If it’s not that hard to be vegetarian in terms of access to the proper food, it can be more difficult in social terms. 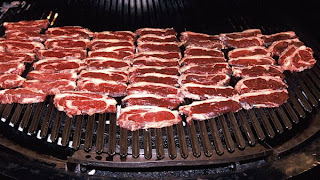 The asado, or mixed-grill barbecue, is not only a staple of the Argentine diet, but also a custom to which there is enormous pressure to conform. Anyone who goes to a gathering of family or friends and declines to eat beef can still become something of an outcast. For that reason, more than a few Argentine vegetarians have returned to their carnivorous roots - or at least decided to go along with the group on such social occasions. In reality, it’s probably harder to be a vegetarian in Uruguay or Chile - especially in rural Chile - than it is in Argentina. That said, it’s not usually a problem if you’re on a guided tour or if you can explain your dietary preferences to the waiter or cook in question (it may be easier to simply plead alergia - allergy - if your language skills are not up to the task). That said, the Santiago restaurant El Huerto may well be the continent’s top vegetarian option, even if first-rate meatless meals are harder to find outside Chile’s capital. In November of 1994, eclipse chasers from around the world converged on the Chilean precordillera village of Putre, near the Peruvian and Bolivian borders, to view one of the longest total solar eclipses on record - more than three minutes. In an arid, thinly populated area with few services, thousands of people camped along the international highway that links the Chilean port of Arica with the highlands of Bolivia, but today there is little evidence that such a transitory event even happened. Something similar could occur next year on Rapa Nui (Easter Island), as the longest eclipse of the 21st century - four minutes and 45 seconds - is due to take place on July 11th. All the island’s 1,500 hotel rooms - nearly all of them in the village of Hanga Roa - have been booked. During the period in and around the eclipse, the price of the five-hour flight from Santiago (LAN is the only airline that goes here) has nearly tripled. In fact, the home of the legendary moai has long been a site for astronomical observations - the statues at Ahu Akivi (pictured here), near the Maunga Terevaka area where a music festival is to take place at the time, stare directly into the setting sun at the spring and autumn equinoxes. Still, there is concern about such an influx to a small island (only 171 sq km, with about 5,000 inhabitants) that is, in essence, one large archaeological site. Normally, over the course of 12 months, about 50,000 unique visitors arrive on the island, though many of them are concentrated in the summer months of January and February (when the ten-day Tapati Rapa Nui festival takes place. It’s unfortunate, given the pubicity that eclipses get, that few foreigners appreciate that Chile is the Southern Hemisphere’s most important single country for professional astronomers. The desert north, from La Serena to Antofagasta and even San Pedro de Atacama, is home to major international observatories such as Cerro Tololo (pictured here), La Silla, and Cerro Paranal; all of these are open to visiting tourists, though tours usually require advance planning and reservations. These are almost invariably daytime visits - the romantic stereotype of astronomers peering through their telescopes on all-nighters has been superseded by their viewing and interpreting data on their computer terminals, mostly during daylight hours. 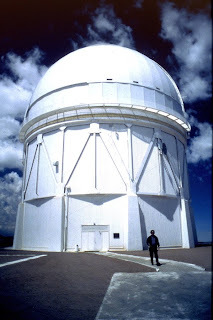 There are also, however, small-scale municipal observatories, such as Mamalluca and Collowara, where nighttime visitors can peer at the southern skies through large, if not quite professional, telescopes. Space Observations is a commercial but engaging and highly professional operator with nighttime excursions on the outskirts of San Pedro de Atacama. A few years ago, as I was delivering a slide lecture on Buenos Aires in Southern California, someone brought up the issue of personal safety in the question-and-answer period. My impulsive response, which brought a nervous laugh from the audience, was that “there are no drive-by shootings in Buenos Aires” - which there are in Los Angeles. It’s true that, before Americans go overseas, one of the first things they think about is crime and insecurity, even if their own country can be as dangerous, or more so, than many foreign destinations. Colombia, to cite one example, has a terrible reputation that lingers from sensational - and sensationalist - stories of its drug wars and guerrilla insurgencies. Mexico, especially the cities along the US border, has seen some horrendous crimes and smuggling of drugs and people to the north is notorious. That’s not to say crime does not exist but, as Insulza notes, “All over the continent news begins with crimes.” A sensationalist emphasis on crime stories, which increase TV ratings and sell newspapers, does a disservice to countries and cities that don't really deserve it. To my mind, for instance, it’s a testament to urban security when park playgrounds near my Buenos Aires apartment in Palermo are full of families with kids well after dark and often until midnight or later in summer. Likewise, I’ve spent extended periods in Santiago and other Chilean cities, without excessive concern for my personal safety. Chile, for its part, has Latin America’s most highly respected police force in its Carabineros. Argentina can’t match that, unfortunately - provincial police in Buenos Aires are notoriously corrupt and highway checkpoints are often opportunities for them to shake down motorists for minor equipment violations - but that rarely affects foreign visitors. Uruguay falls somewhere in between, but closer to Chile - its police are generally trustworthy. With all of them, though, investigative professionalism lags behind. Buenos Aires, meanwhile, is creating a new municipal police force to take over many of the functions of the Policía Federal (pictured here), which until now has handled police matters in the city. The feds are arguably more competent than provincial forces but it remains to be seen whether the new force, whose officers are mostly ex-feds, will be any improvement.